Samsung HMD promotional image courtesy of Amazon (affiliate link). Alright, I’ve been using my VR headset for months now, so it’s time to review the Samsung HMD Odyssey. This is something that was an incredibly expensive “impulse” purchase for me, in the sense that I was planning to eventually get a VR headset, and I’d been saving up money for one, but I basically tried it out in the store and then knew I had to have it. First things first, you need to understand where Windows Mixed Reality stands on the VR Headset market. Windows Mixed Reality is basically what you would call a VR headset. The Mixed Reality term is something of a misnomer; the system doesn’t support any AR or MR features, like interacting simultaneously with physical and digital objects. The outward cameras are apparently IR-only, though I haven’t heard much about this or checked it out myself, so don’t expect further support in a software update. The Windows Mixed Reality platform works well on Windows, obviously. There are some third-party open source systems that claim to have some support for them, but the only experience I have is with OpenVR, which only works with WMR on Windows through the Mixed Reality Portal, which is a native Windows application. However, once you have a WMR headset, you will find that 90% of the VR software out there is compatible with it. I haven’t had any issues with abject incompatibility, and while many experiences are designed with the outside-in tracking rather than the inside-out tracking of WMR that won’t be too much of an issue. The selling feature of WMR for me is that it has inside-out tracking. This can create a handful of issues (for instance, I find it hard to get height scaling correct at times), but it also means a vastly reduced setup and the ability to play in any environment. I literally just push my chair back from my desk when I’m ready to use the headset, and then back up to it so that I have a frame of reference so I don’t start punching furniture. This means that there aren’t any cables or battery-powered equipment required other than the headset and motion controllers. Low setup, low maintenance, and low clutter are the selling points of the WMR setup. I have occasionally experienced some minor hiccups with tracking, but it’s not usually significant. The tracking FOV is pretty good, and you usually can figure out what went wrong and fix how you’re holding the controllers once you’ve spent as much time in VR as I have, which is not an astronomical amount of time. An important note here is that not every VR device has the same controller, but the WMR controllers are pretty robust, with trackpads (that have touch sensitivity and d-pad style pressing functionality), thumbsticks (that click in), menu and grip buttons, triggers, and a Windows button, they really are as functional as a gamepad with the extra feature of motion tracking to add icing to the cake. Well, I’m a little brand loyal to Samsung. I can’t really afford many Samsung products, or at least not cutting-edge ones, but I’ve always had good experiences with them. 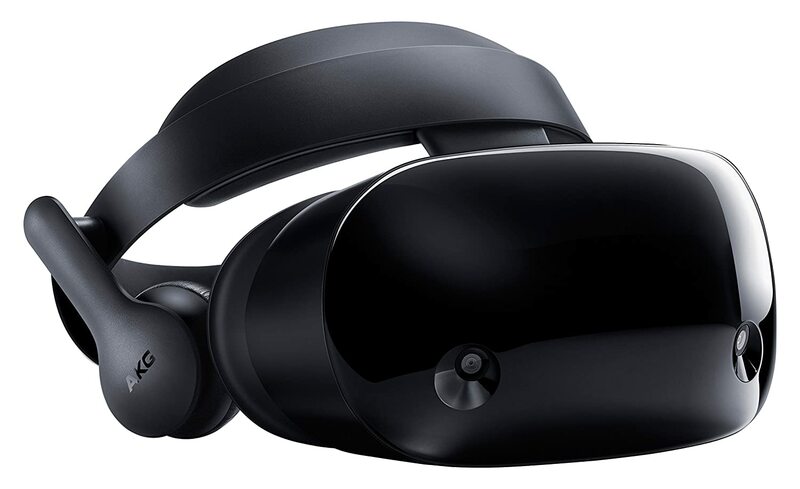 However, the real selling point on the Samsung HMD Odyssey is that it’s got a little bit more cutting-edge technology in it than some of its competitors. This is marked by a higher price-tag, but it is made up for in a couple ways. First, there’s a higher FOV and vertical resolution, which pays off. The 110 degree FOV is nice, though I don’t have experience with other headsets for a comparison. You’ve got about 160 more pixels of vertical resolution (1440×1600 panels), with AMOLED rather than LCD displays. Let me just say this: looking through the lenses, the only obvious difference between reality and VR comes from how stuff is rendered and the occasional grid effect, which only happens when you’re really focused on certain things (I find it to matter only in rare cases where I’m closely examining distant objects). Another feature is the integrated headphones and microphone. These weren’t necessarily deal-breakers, but certainly set Samsung apart from the other WMR headsets. It’s worth noting that the headset is a little heavy. If you strap it down right, a lot of the weight balances well, but wearing it too loose will cause issues, something that I often encountered during play sessions when it was pushing 85 degrees in the room. One of the things that I noticed about myself when I play in VR versus outside VR is that the experiences are a lot more personal. One of my favorite VR experiences is Skyrim VR, and it definitely feels more frenetic and emotionally charged than standard play (and I’ve got over 400 hours to compare to). Archery and gun-play cannot be approximated by traditional control schemes, but are really fun with motion controllers. I haven’t really tried any of the VR setups that are intended for mouse and keyboard or gamepad play. I’m strictly using motion controller-based titles. The motion controllers are pretty nice; I have some issues with the battery hatch coming loose on the right controller from time-to-time, but I also have large hands and tend to mash my grip down really hard, which means that I’m essentially pushing on them in exactly the way you’d want to open them. It’s not a huge issue, and being conscious of my posture when I hold the controllers mitigates this. Every game has a slightly different control scheme, which is a pain, but not insurmountable. I’ve generally found that many of the “issues” with VR can be overcome if you’re willing to invest a little time in it. Motion sickness, for instance, was an early issue. After a few hours, however, I found that it went away in 90% of cases. I also keep a physical frame of reference (the seat of my chair) and a fan blowing toward me, which helps as well. I’ve found that with this setup I don’t even need comfort settings in many games. I did have an issue where one of the lenses of my display cut out while I was playing. Samsung was pretty easy to deal with and I was able to send it off for service and have it back in about a week (service was covered under warranty). In general, do I recommend a VR headset? Definitely. Maybe not yet; $500 is a little steep, but if you want a much more immersive experience and you’re going to use the headset a lot, then I think it could be a good investment. The Samsung Odyssey has been treating me really well. Barring that one incident I described above, it’s functioned flawlessly. I use rechargeable batteries in the motion controllers (affiliate link), which reduces the cost of operating the system a little over the long run. Each charge lasts for about a week or two of fairly “heavy” use for me, or a month or so if I’m using the headset very intermittently (like, say, during July when it was too hot to wear the headset). As far as the different options go, I wholeheartedly recommend the Samsung offering, which is available at Amazon (affiliate link). When I got mine, I got it from a Microsoft store physical location and got a 10% educator discount, but if you’re not getting it in person I would strongly suggest Amazon; I haven’t had a bad experience with the Microsoft store online, but I don’t trust their shipping quite as much as I trust Amazon’s.